GameTime discusses how the Jusef Nurkic injury will affect the Trail Blazers into the playoffs. Count down the best plays from Monday's NBA action with the top five. Selected by the Chicago Bulls in the first round (16th overall pick) in the 2014 NBA Draft ... Traded to the Denver Nuggets on draft night ... Signed with the Denver Nuggets on July 31, 2014. Nurkic, 7-0, 280, averaged 11.7 points and 5.7 rebounds in 28 games for Cedevita Zagreb of the Adriatic League in 2013-14. 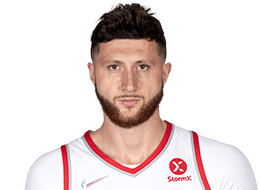 He recently led Bosnia and Herzegovina to the title at the FIBA Under-20 European Championships Division B. Nurkic, 19, averaged 21.4 points, 12.0 rebounds, 3.3 assists and 2.63 blocks in eight games and was named MVP of the tournament.